Now known as Kirkcaldy Galleries, the centre hosts an art gallery, museum, library, cafe and tourist information. The library, museum and art gallery in Kirkcaldy has been reopened after an 18 month refurbishment. Now known as Kirkcaldy Galleries, the centre hosts an art gallery, museum, library, café and the tourist information centre. The £2.5m project has restored the building’s original features. The opening event on Friday was attended by 150 people including local MP Gordon Brown, artist Jack Vettriano and author Val McDermid. Former Prime Minister Mr Brown officially opened the building. 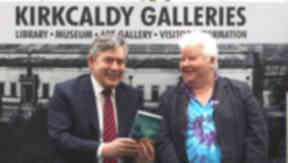 He said: "Kirkcaldy has just about the best library, art gallery and museum for a town of its size and I am delighted that I have had the privilege of performing the opening ceremony of a library I used as a school pupil. "The £2.5m invested in the upgrading, the new exhibitions and the modernisation of the library will be of as much benefit to today’s younger generation as the library was to me when I was growing up in Kirkcaldy. "The events surrounding the opening that include Val McDermid, Jack Vettriano and Ian Rankin, as well as the historian Tom Devine, show Kirkcaldy is leading as a cultural and arts centre. And at a time when libraries are being closed in other parts of the UK, I am proud that Fife is investing in the future." Val McDermid said her love of reading had started at Kirkcaldy Central Library. She said: "The importance of reading can’t be underestimated. Stories and are the lifeblood of our society, developing the fundamentals of imagination, creativity and literacy, expanding our horizons, changing our perceptions, and boosting our ambition. "It’s not just potential writers who have found inspiration but scientists, entrepreneurs or anyone who is interested in changing the world around them." Artist Jack Vettriano also praised the gallery where his career started and took off. He said: "This building is where it all started for me. I’m possibly the only person here who owes their career to this outstanding facility and collection of art. "Kirkcaldy Galleries is something we can admire. The design and quality of the work undertaken by Fife Council and all those involved, including the vision and design, is something that John Nairn would surely have been thrilled with." Grant Ward from Fife Council said it was important to keep the original features of the historic building intact. He said: "This popular historic museum was first opened in 1925 as part of the town’s War Memorial and the library extension was added in 1928. It now offers a modern open plan library, fully refurbished art gallery and museum, new local & family history room and larger café and shop. "Good project management and craftsmanship opened up a range of opportunities during the project and features such as the wonderfully revamped marble entrance and recovered herring bone pattern wooden flooring from 1928 in the café take pride of place in the new facility. Customers have been most interested in the fate of the building’s quirky basement toilets which I’m pleased to say have been wonderfully conserved and restored."